thank my body, my spirit, my mind. A diverse group of friends share poems and step by step child friendly poses to guide little ones in transitioning from restless readers to yawning yogis. I bow my head and my light shines through. Laurie Jordan took her first yoga class at the tender age of ten and promptly got kicked out for laughing at the names of the poses. Who would have thought that all these years later, she would make a career out of teaching yoga? Laurie is now a social worker turned yoga teacher and children's book author. And while Laurie enjoys working with folks of all ages, she has a soft spot for kids, knowing that good habits start young. 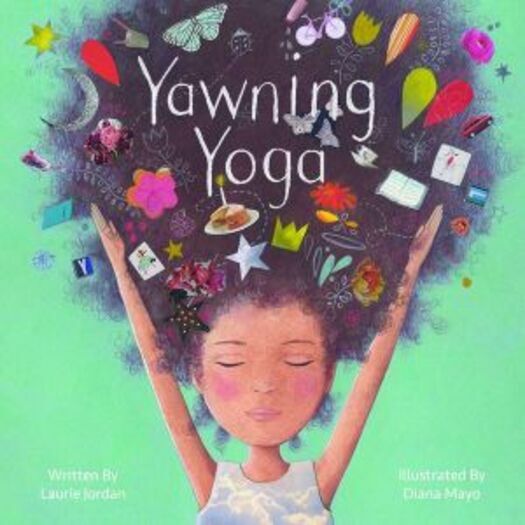 After teaching yoga to thousands of kids and training hundreds of instructors in the specialty of kids' yoga, Laurie decided to write Yawning Yoga to help families conquer bedtime jitters and soothe the restless child. Today, Laurie teaches yoga throughout New York and Connecticut. And she still giggles every time she says Down Dog. Diana Mayo is a successful, freelance illustrator working in Chelmsford, just outside London. She gained a Ba(Hons) at Kingston University, and has since illustrated many children's books as well as adult fiction, editorials, gallery shows and design projects. Diana paints with acrylics, and more recently collage is finding itself part of her art. She especially loves working with color and pattern, and is inspired by fairy tales, her children and the flora and fauna found in her garden and beyond. She lives in Chelmsford, UK.